temporary discount 3 Aug - 10 Aug €6.875,- p/w. A great villa with an even greater view! This villa is built upon a mountain looking out over the entire Morna Valley and half of the island, making it a very special place. 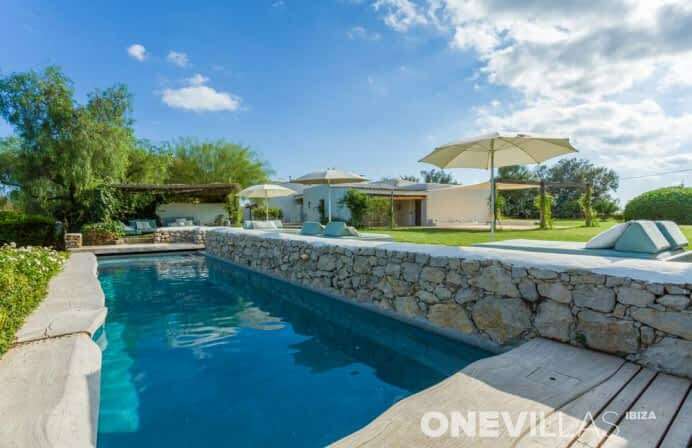 The amazing swimming pool (11x 5,5), a beautiful terrace and a wonderful outdoor kitchen, complete the picture making Villa Morna Valley is highly recommended place to stay! The villa is built in 2015, so everything is completely new! The owners also possess Sitges and Xumeu and have proven to deliver quality and happy clients! 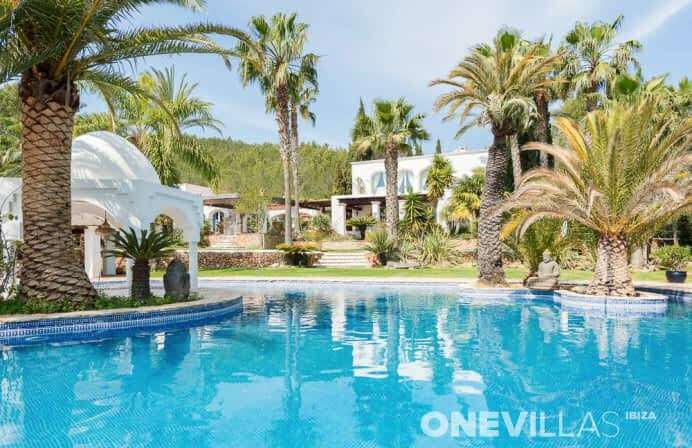 Location wise, the villa is quite central on the island; only a 2 minute drive to Atzaro, 5 minutes to the Las Dalias market and 10 minutes to Santa Eulalia. The most beautiful beaches of the north coast, such as Cala Nova and Cala Llenya are only 15 minutes away. The interior of this home has beautiful! Moroccan influences with spacious rooms and big windows that make it very luminous. A large living room is to be enjoyed with a nice seating area, a dining table and a small open indoor kitchen, just in case it rains. Normally only the outdoor kitchen is used, however it is always nice to have a plan B. This wonderful, fully equipped outdoor kitchen with phenomenal views is situated right above the pool area under a large covered terrace together with a large dining table, lounge area and a bathroom with shower and lavatory. (Unfortunately there are no photos to view yet, as it´s still under construction). Inside the villa there are 4 bedrooms, 2 on the ground level and 2 upstairs. 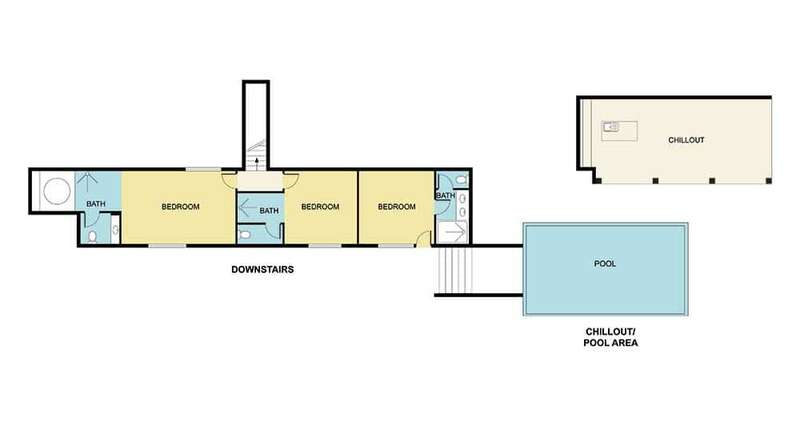 These 2 bedrooms are to be reached via a wide staircase from the living room. One of the bedrooms is accessible from the outside only, via a staircase from the terrace. 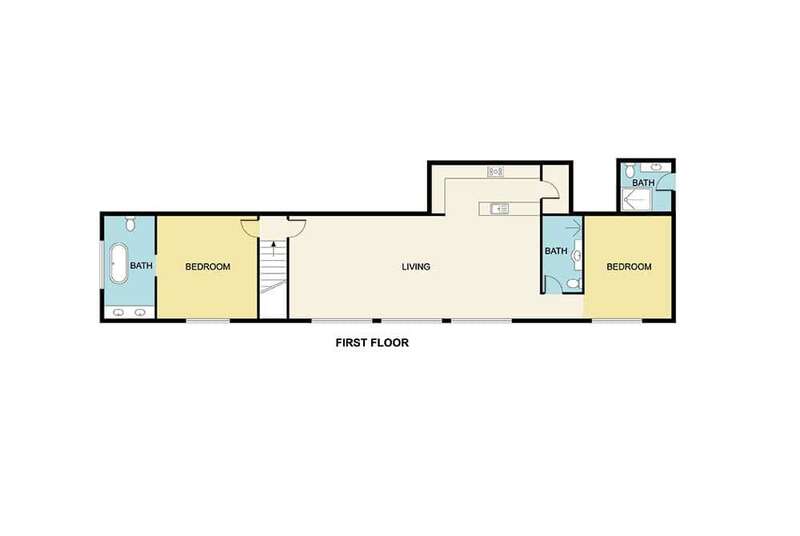 All bedrooms have double beds however, 2 bedrooms can be provided with 2 single beds, upon request. Furthermore, all rooms are air conditioned, have built-in wardrobes and a large en-suite (open) bathroom. Alongside the entire villa, a spacious terrace with a lounge area is to be indulged, where you can chill and enjoy the wide view this villa has to offer. On the rooftop, a shaded area has been created, which makes it an ideal spot for a relaxing yoga session. Note that the villa is not fenced and has no gate. The owners however, have taken precautions by installing an alarm system and hiring a security team that drives by several times per night to assure safety. Next to the house, above the pool, there is a large covered terrace with a wonderful, fully equipped outdoor kitchen and phenomenal views. There is a large dining table, lounge area and a bathroom with toilet and shower. Additional service: 1x p.w. change of towels. Parking space for 8 cars. beautiful villa, lacking nothing, friendly helpful owner. Highly recommended!!! Just the unpaved road up towards the house makes you so curious what you will encounter. The moment you arrive at the house and see the view your holiday begins. A lovely spacious house with 4 spacious bedrooms in the main house and 1 bedroom via entrance in the garden. Each bedroom has its own luxurious bathroom. The whole holiday we spent our time at the well-kept clean pool and outdoor kitchen. The outdoor kitchen is equipped with fridge, cooking island, microwave oven and even a dishwasher, luxury at its best! beautiful villa, which is definitely worth it. The villa is a dream and looks like the pictures on the internet. The view when they are in the pool on the edge is heavenly. By car you can reach every point of the island in 30 minutes and the taxi drivers are also not so expensive. The owner and his family are great and have even brought us wine. We could. Call the owner and he has organized us taxis. Although some glasses and something on the fridge broke down we did not have to leave our bail feathers. However, we have voluntarily returned a small amount. Beautiful luxury villa with beautiful lookout. A bit further from shops. We did suffer from the wind and the sun disappeared behind the mountain. We would go next season in high season and not in spring and autumn because of the temperature there on the spot. Beautiful villa and the owner wasn't very helpful and welcoming. 10/10 for everything for the villa, owner and support from the One Villas team. My family and I have stayed in lots of villas over the years and this was the best. We didn't want to leave and wished we had booked to stay longer. Couldn't fault anything. Stunning location in the Morna Valley near San Carles - perfect for either side of the island. Fabulous views. fantastic house for families travelling together. the outdoor kitchen and living area was a highlight - we never used the indoor areas at all! Great! Enjoyed this beautiful house with amazing views !! Fantastic house, beautiful location, in one word amazing !! top home! everything is fine. Fantastic. Everything from the pre-holiday communications right through to the villa itself, this holiday was great. The villa is even better than what it looks like in the photos. It is much bigger than it looks and the attention to detail with the finish is exceptional. The owner is a lovely guy, very accommodating. Would recommend to anyone. The house is beautifully appointed with amazing views. The outdoor kitchen, dining, lounging area allows you to spend all your time outside which is fantastic. The owners are very helpful and a pleasure to rent from. We will definitely be coming back. Patrick. We had a wonderful holiday and the villa was beautiful. One Villas were very helpful at all stages, making for a smooth process. During the week of 4 t / m June 11, 2016 we stayed at Casa Morna. The villa is absolutely fantastic, one room is more beautiful than the other. The view from the pool is superb. Actually everything was great! Morna Valley is a beautiful villa with a great view. The house is decorated with lots of love and taste and has lovely spacious luxury rooms. Two super beautiful kitchens, one inside and one outside with all the trimmings. We come here quite like to return one day.